I stopped for tea just before reaching the village I would be staying at. There were two small mud huts with an open fire outside where you can stop for food while traversing the hills. Sitting there is like being in a National Geographic documentary, life here in rural Nepal is a whole different universe. A stunningly beautiful wide eyed young girl, no older than seven, walks up the road with her baby sister tied to her back with a scarf. She shyly returns my greeting and comes to squat next to the fire with me. The girls’ mother, a women clad in a red sari type garment, is preparing milk tea beside us on the open flame. There are three walls and a roof to this mud hut, leaving a wide open area where I can see out. There is another hut, almost identical, across the unpaved road where a women in her early twenties is trying to put sandals on her one year old baby girl. The little girl squeals when she sees us, and comes waddling over, carrying one sandal in her small hand. Her messy hair is swept into two small pig tails on her head, and her half unzipped jacket is caked with dirt. Her little nails are brown as well, a sign that she is a girl being raised by the land. An elderly hunched over man makes his way over to us using his cane for support and asks me who I am. Soon there is a small crowd, the six or seven people who live at the top of this hill all want to hear the answer. 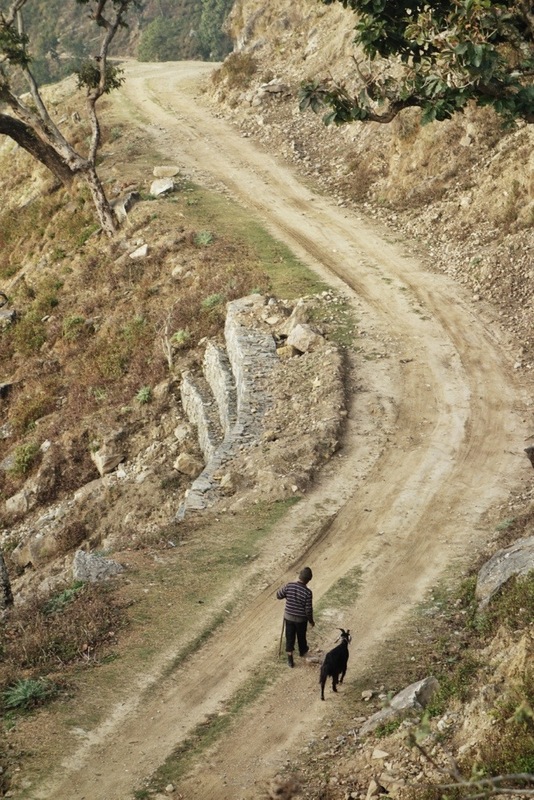 I hear the telltale yell of a herder, and see a young boy chasing his cows down a small path and onto the road. He too checks me out curiously before continuing down the mountainside. As I am drinking my milk tea I see two ladies, strong mountain farmers, walking slowly up the hill carrying huge baskets of branches and grass on their heads. I look down and see the two young girls chasing each other, falling down every few steps but laughing with glee all the same. I grab the cat who is walking past me, and though the elderly man warns me that the cat scratches, the soft animal promptly falls asleep curled up in my arms. It is a surreal moment, with the happy dirt covered children chasing each other, the strong mountain farmers walking past, the elderly man with the cane sitting across from me, and a purring cat snuggled close in my lap. This entry was posted in Nepal and tagged far western Nepal village, life far western Nepal, National geographic moment, rural village Nepal by The Wandering Nomads. Bookmark the permalink. Shirine! This is beautifuuly written! Your descriptions paint a lovely potrait of this encounter. Wow! Thanks! Hugs!